Exceptionally maintained and priced to sell, Cobblestone Park homes offer a variety of ranch and colonial style homes! This family friendly community has charming curb appeal. Backing up to Cobblestone Park, these move in ready homes are perfect for the family with children and pets! Waite Elementary School is within walking distance! Make your commute easy by being close to the necessities yet enjoy the peace and quiet of this quaint neighborhood! Homes in Cobblestone Park feature bright and open floor plans ranging from three to four bedrooms. If one level living is what you desire there are plenty of ranch homes available! Each home is unique in style. Great rooms have vaulted ceilings, which adds to the bright airy feel. Large windows let in bountiful amounts of natural lighting. Kitchens are modernized and some come with luxury upgrades such as granite counter tops. You will find plenty of storage space with the gleaming oak cabinetry. Enjoy a cup of coffee while reading in the attached morning room! Stone fireplaces in the family room provide an excellent area to stay cozy during the cold Ohio months. Bedrooms are spacious in size and offer neutral paint and plush carpeting. The master suite has its own private bath featuring double sinks and soaking tubs. Additional bedrooms are also gracious in size, allowing you to personalize as you wish! The fully finished lower level provides extra space for creating a kids play area, recreational room or additional living area! The choices are yours! Step out onto your private deck and enjoy the Medina sunsets. Bring out the grill and enjoy a cookout with friends and family! Cobblestone Park homes have a gorgeous view and plenty of layouts to choose from! 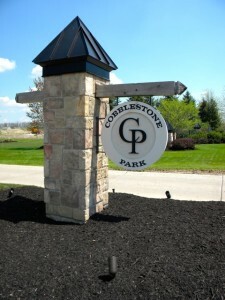 Located in lovely Medina Ohio, Cobblestone Park is the development to find contemporary homes at a reasonable price. Built to impress, you will surely find the home perfect for you and your family. A phenomenal city to call home, Medina gives a country feel yet is close to shopping, entertainment and major highways. If you enjoy nature, Medina offers some of the most beautiful parks perfect for escaping from the hustle and bustle of city living. Find your peaceful retreat at Cobblestone Park! Don’t wait, call one of our Medina homes specialists today! Contact us for a private showing of Cobblestone Park Homes for Sale. A top agent from The Medina Ohio Homes Team will contact you shortly.